After sharp year-on-year increases in 2008 and 2009, the number of corporate insolvencies has steadily decreased every year since. According to figures provided by the US Courts, the number of business bankruptcies filed in Federal Courts declined 8.3% year-on-year in 2015, to 24,735 cases. However, in 2016 business insolvencies are expected to increase again, by around 3%, as exporting businesses struggle with lost competitiveness due to a stronger US dollar and the on-going problems in the oil and gas sector. The loss of profits has forced many oil and gas businesses to file for bankruptcy. Many companies are highly leveraged, having taken on a lot of debt during the boom period. At the same time, access to bank funds as well as access to capital markets has been reduced. 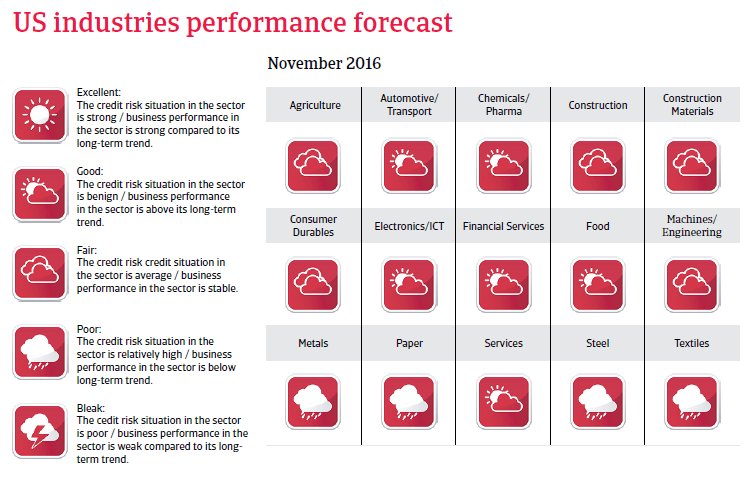 In 2017, a modest insolvency decrease of 1% is forecast. 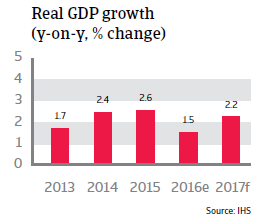 After increasing 2.6% in 2015, US economic growth is expected to slow down to 1.5% in 2016, followed by a rebound of 2.2% in 2017. 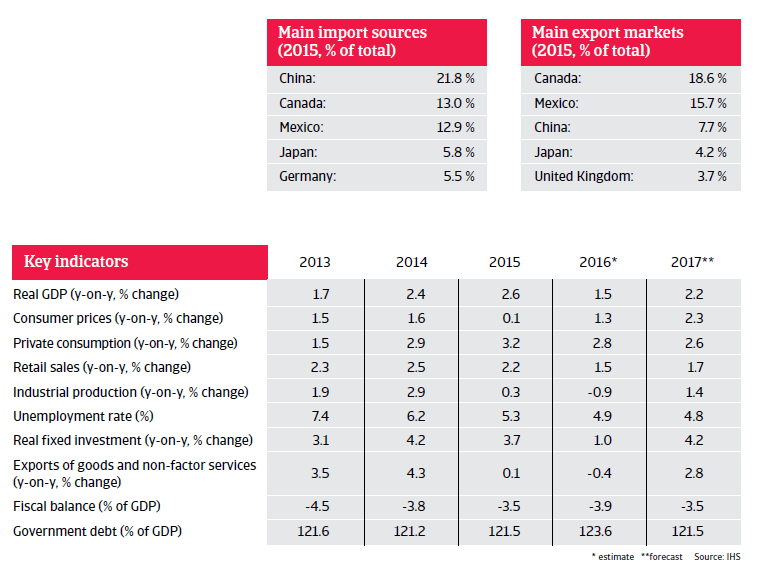 While domestic demand is the main driver of economic expansion, manufacturing and exports continue to suffer from a strong USD, and investments are still hampered by the current problems in the energy sector. Downside risks have increased over the last couple of months due to increased volatility in the world economy and international markets, which could hurt US consumer confidence and business sentiment. Household consumption accounts for almost 70% of US GDP and has been the most important engine of growth since 2014. Private consumption is expected to further sustain US economic growth, increasing 2.8% in 2016 and 2.6% in 2017. Household consumption has been aided by a strong USD, low inflation and low interest rates. Due to the low interest rate environment, US consumers have increased their purchases of big-ticket items like cars and houses. The US consumer price index (CPI) decreased since mid-2014 as a result of declining oil prices, to 0.1% in 2015, and then increased to just 1.3% in 2016. While the lower oil price has reduced the profits of producers, it has benefitted consumers, who have spent extra money. 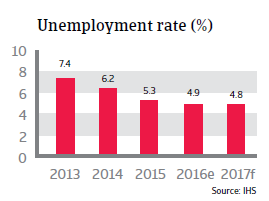 Another important factor for rising consumer confidence and spending is the lower unemployment rate, which decreased from 7.4% in 2013 to below 5% in 2016, and is expected to decline further in 2017. Job security has increased and nominal wages have finally begun to tick up, albeit modestly. The proportion of working-age Americans, who are economically active reached 62% in September 2015 (the lowest in nearly four decades) and has risen every month since then to 63% as of March 2016. The gradual rebound of the participation rate is further evidence of the US labour market becoming more robust, as it outweighs downward forces such as the retirement of the baby boomer generation. A downside risk for household consumption growth in 2016 could be greater stock market volatility, given the relatively high exposure to equities through investments and/or retirement savings. While private consumption has proven the be the main driver of economic growth during the last couple of years, it is still not very strong by historical standards, which is the main reason why yearly GDP growth rates below 3% seem to be the new normal for the US economy. Average wage growth has been modest since 2009. While growth in average hourly earnings has increased from about 2% to around 2.5% since early 2015, this remains sluggish compared to wage growth before the 2008 crisis, which often exceeded 3%. Additionally, a large share of job gains have been in low wage industries or part time jobs. At the same time many households have continued to deleverage, at the expense of additional spending. Household debt as a share of GDP has decreased from almost 100% of GDP in 2007 to 78% of GDP in 2015. For the time being, US companies continue to benefit from low financing costs as the Federal Reserve has, thus far, abstained from raising interest rates in 2016. However, while the strong USD has increased US consumers’ purchasing power for foreign goods, it has hurt the international competitiveness of US export businesses, with their profit levels decreasing. Since 2015 US exports have been contracting, with just a small rebound expected in the course of 2017 at the earliest. At the same time increasing (cheaper) imports continue to crowd out some domestic producers. This adverse development mainly affects the manufacturing sector. 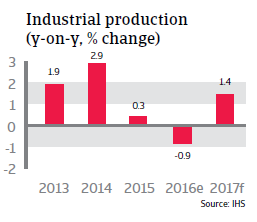 After feeble growth in 2015 industrial production growth has contracted in 2016, and is expected to record only modest growth of 1.4% in 2017. In 2016 business investment remained subdued as the US energy sector adjusts to the low oil prices. Investment in oil rigs has fallen by almost 70% over the past two years. Government spending and private inventories have also remained subdued. That said, residential building investment has increased in 2016, and investment by state and local governments is poised to rebound after years of austerity. 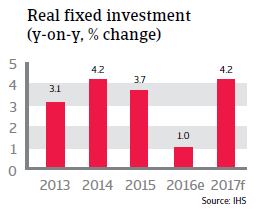 Therefore, real fixed investment is expected to recover in 2017. An interest rate increase in late 2016? So far in 2016, the US Federal Reserve has left the overnight lending between banks in a range of 0.25% to 0.5%, but suggested it would raise them by the end of the year. Despite on-going economic growth and solid gains, this decision to delay an interest increase was motivated by increased uncertainty regarding the global markets and its potential effects on US growth and the inflation rate, which currently is still below the Fed´s 2% target. Following the burst of a large debt bubble and the drawdown of household debt after the 2008 credit crisis, demand for credit has been low. Despite the effective federal funds rate hovering close to zero since early 2009, lending growth to households has remained subdued. In 2015, household borrowing from banks rose only 2.1% compared to 12% prior to 2007. This suggests that in an environment of deleveraging, the use of monetary policy alone cannot sustain the recovery.